A well-deserved break was enjoyed by all. Welcome back to a busy term 3 for 2018. The calendar was sent out. Please make use of all the opportunities available for the learners. We welcome Mrs Pienaar to Willowmoore High School. She will be teaching in the Afrikaans post. Mrs Russell will be away in August and September and Ms Passmoor and Ms Mholo will be teaching Geography and SS respectively. A reminder about parent’s day which is to be held on 28th July from 8.30 to 13.00. Please come and see you child’s educators. Please ensure that you have your child’s report and encourage your child to accompany you. Mrs Silverthorne and Mrs Kleynhans will unfortunately not be available on Saturday. Please make a separate appointment if you need to see these educators. Thank you to all the parents who have paid school fees. Thank you for the donations towards fund raising. At the moment we have received R 30 000 towards upgrading our outdoor areas. Thank you for all the donations towards Mandela Day. 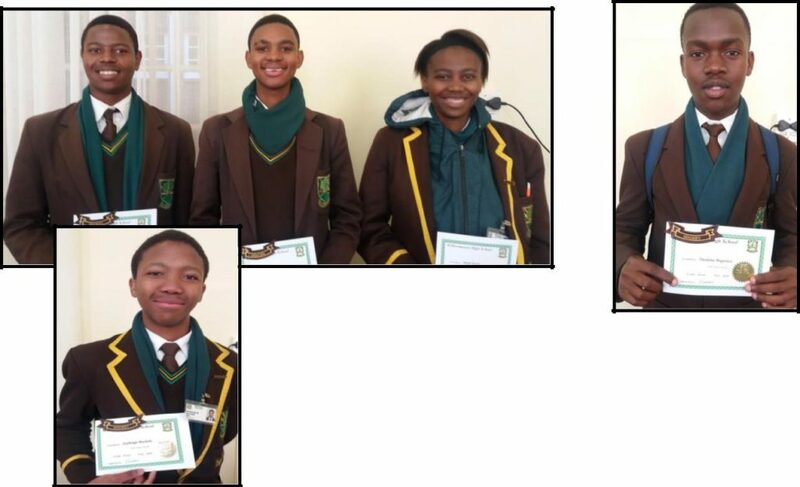 C Netshikulwe and N Magagula – Cross Country captains for 2018. Thank you to Mrs Naidoo and all those who put in so much effort towards the tea for the elderly on Mandela day. Your contribution is highly valued. Together, the Governing Body and the staff have taken a decision that we will not tolerate learners who are disruptive in class – either being noisy, not bringing books, not doing homework or being late for class. After THREE (3) offences, the learner will be suspended for 5 days pending a Governing Body disciplinary meeting. The cycle will continue until the learners co-operate and understand that others have the right to be taught and that educators have the right to teach. Placements will start on 3 August and parents have 7 days to accept online. The parents must come in to the school to collect forms and information about the grade 8’s programme of orientation. All money must be deposited directly into the school account or you may swipe a card. For safety reasons, we will not be taking large amounts of cash at the accounts office. Grade 12 Prelim Exam timetables for the preliminary exams were circulated at the end of June. There have been some changes to the time table and a new time table will be issued on Friday this week. Please ensure that your child is studying and putting in the time required for each subject. Extra lessons are taking place every afternoon until prelims start. It is disappointing to note that some learners who failed the June exams are not taking advantage of these extra lessons. All school rules apply while learners are in school uniform from the time the learners leave home in the morning until they return home again. They do not lapse if the learner is off the school property or if it is outside of school hours. STOP, PICK IT UP and PUT IT IN THE BIN. Everyone can help and do their bit to keep the environment clean.